Home» TS Govt Programme | TS House Hold programme | TS House Hold Survey Elect Limca Book Record | TS LATEST UPDATES | Ts new gos » TS Household Servey Programme to elect Best Limca Book Record-2016. 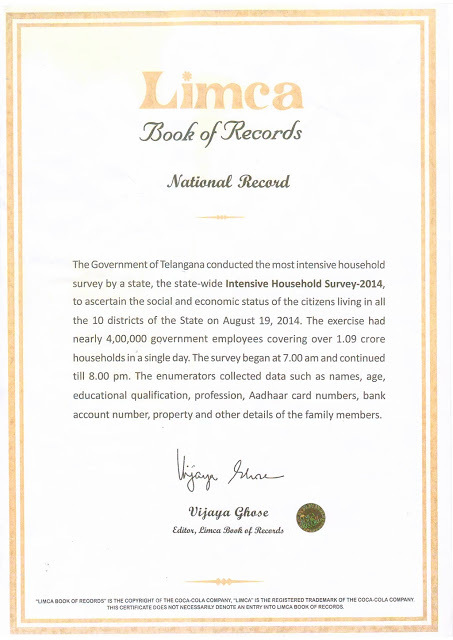 TS Household Servey Programme to elect Best Limca Book Record-2016. Telangana Household Servey Programme Get Limca Book Record , TS Household Servey Program to Elect 2016 year Limca Book Record , TS Employees Household Servey Programme to elect Best Limca Book Record , Telangana TS Employees Household Servey Program to elect Limca Book of the Year in 2016 Record. Telangana Household Servey Programme Get Limca Book Record. The Government of Telangana conducted the most intensive household survey by a state wide Intensive Household Survey 2014, to ascertain the social and Economic status of the citizens living in all the 10 Districts of the State on August 19 - 2014. The exercise had nearly 4,00,000 government employees covering over 1.09 crore households in a single day. The survey began at 7.00 am and continued till 8.00 pm. The Enumerators collected servey Data such as Names, Age, Educational qualification, profession, Aadhaar card numbers, Bank account number, property and other details of the family members. Get More about Information visit at official website at limka book records 2016.